Migrant arrivals to Spain continue to increase, with 103 migrants - including seven women and 55 children - rescued in just 24 hours from four different vessels. The Spanish government aims to cut migrant arrivals in half this year compared to the 64,000 arrivals in 2018. Migrant arrivals off the coasts of Spain are showing no signs of slowing. In just 24 hours, between the evening of February 6 and early morning on February 8, the Spanish maritime rescue service saved a total of 103 migrants, including seven women and 55 children, from four different vessels in the Straits of Gibraltar. The first boat, carrying five migrants from sub-Saharan Africa, was intercepted by the "Salvamar Acturus" patrol boat at 10:30 a.m. on Wednesday, February 6. The migrants were transferred to the Port of Algeciras. Three hours later, another seven people from sub-Saharan Africa, traveling on a sinking rubber dinghy, were rescued by the same patrol boat. On Thursday evening and into Friday morning, maritime rescue services saved another 77 migrants of Maghrebi origin, most of whom were minors, traveling on a boat in the Straits of Gibraltar. A fourth boat, with 14 Maghrebi men aboard, was also rescued. Spanish authorities and the EU border agency Frontex have expressed alarm over migrant arrivals at European borders, especially in the case of unaccompanied minors. The most recent Frontex report, cited by Spanish daily El Pais, said the migrant phenomenon "continues to be worrisome." The report said Moroccan families are increasingly sending their children alone to emigrate. According to Spanish Interior Ministry figures: 70 percent of unaccompanied minors who arrived in Spain in 2018 were from Morocco. The UN Refugee Agency (UNHCR) said 3,000 of the 5,500 minors that arrived in Spain in 2018 were of Moroccan origin. 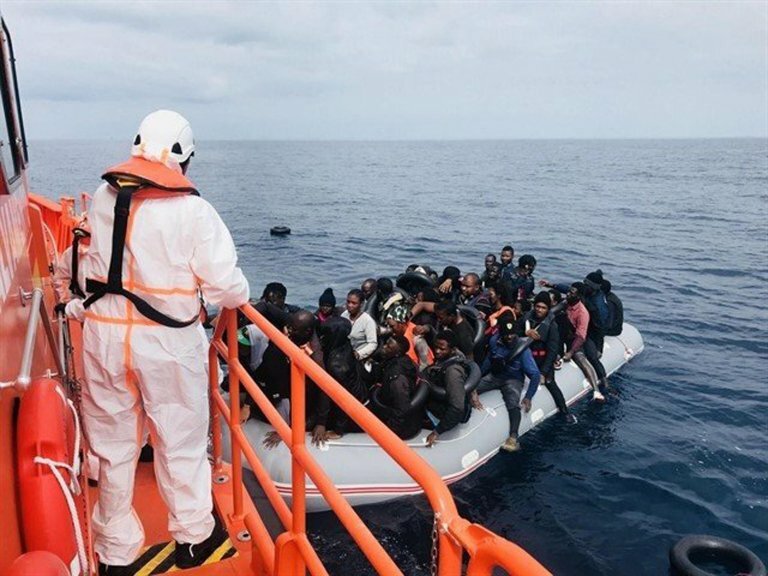 It said it is seeing continual strong migratory pressure on the Western Mediterranean route, with migrant flows departing above all from Morocco. Although in recent years the majority of migrants were from sub-Saharan Africa, since last June the number of migrants from the Moroccan Kingdom has become worrying and now represents the most numerous group. The Spanish government, which is working to strengthen its cooperation with Morocco to slow migrant flows, is also working to reduce migrant arrivals in the country this year by half, compared to the 64,000 arrivals in 2018. The latest Frontex report mentions the lack of jobs and the reinstatement of mandatory military service for men and women in Morocco, which will take effect in September 2019, as two of the factors pushing young Moroccans to emigrate. In all, in the month of January alone, at least 4,104 migrants on 98 vessels landed on Spanish coasts, an increase of 200 percent on last year's figures in the same time period, according to interior ministry data. Deaths at sea have also gone up on the Western Mediterranean route. At least 62 people lost their lives or went missing on the route from the beginning of the year to February 5, over double the number during the same period last year, representing a 121 percent increase, according to data from the International Organization for Migration (IOM).